When it comes to making gnocchi, we typically think about it being a long process. But this semolino gnocchi recipe is very simple! You don’t have the mess of making a classic pasta dough. Also once it’s shaped, the gnocchi are baked and not boiled. You can easily feed a crowd and they can be prepared in advance. Bring the milk to a slight boil, then add coarse sea salt and the butter. Turn off the heat and add the egg yolks, parmigiano cheese, a sprinkle of nutmeg, and pepper. To shape the gnocchi, use an ice cream scoop by dipping it in a bowl of water to prevent it from getting too sticky. Arrange the shaped gnocchi on a baking pan and sprinkle them with flakes of butter, parmigiano cheese, and sage. You can make tight rows keeping the gnocchi close because they will not stick to each other. 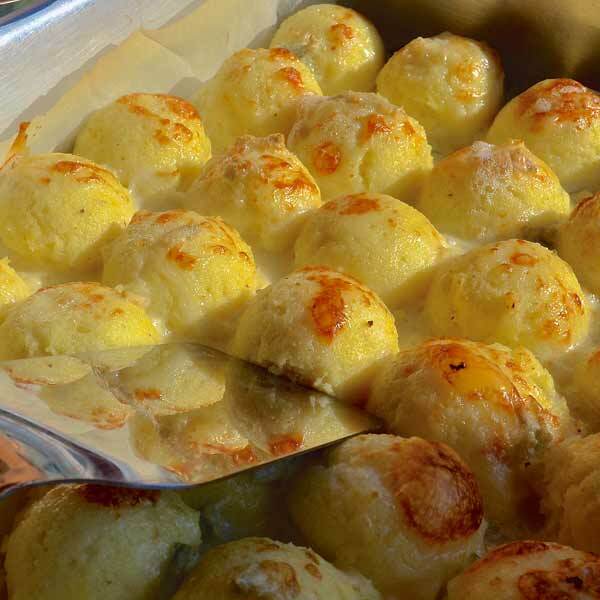 Bake in the oven at 200°C / 400°F and bake the gnocchi until golden brown. *Before shaping the gnocchi, you can add all different kind of ingredients to the cooked semolino, such as spinach (your gnocchi will be green), squash (orange gnocchi), sausage, and more. You can change the toppings by replacing butter and sage with gorgonzola and tomato sauce. The options are endless! You can also prepare the gnocchi ahead of time and freeze them before baking.